Sacred art installation of mural and table for the shrine of "Our Lady of Lujan" by the celebrated American artist Guillermo Esparza unveils at St. Patrick's Old Cathedral in New York on September 27, 2009 as part of the continuing events celebrating the Cathedral's 200-year anniversary. The mural and table for the shrine of "Our Lady of Lujan", commissioned by Rev. Carlos Mullins, becomes permanent installation at the Cathedral. Sacred art installation of mural and table for the shrine of "Our Lady of Lujan" by the celebrated American artist Guillermo Esparza unveils at St. Patrick's Old Cathedral in New York on September 27, 2009 as part of the continuing events celebrating the Cathedral's 200-year anniversary. 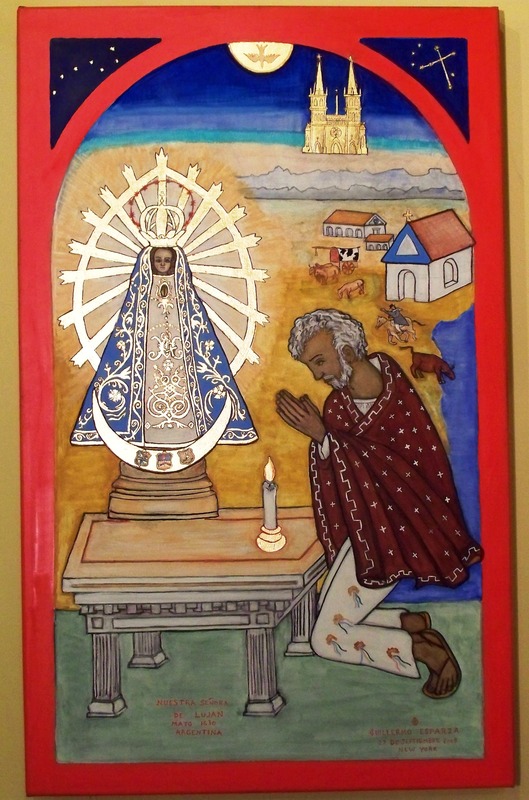 The mural and table for the shrine of "Our Lady of Lujan", commissioned by Rev. Carlos Mullins and the Argentinean-American Association of Our Lady of Lujan, becomes permanent installation at the Cathedral. The mural of "Our Lady of Lujan" by Guillermo Esparza was executed in oil and gold on linen. It depicts the miracle of Our Lady of Lujan, which took place in 1630 in Argentina. 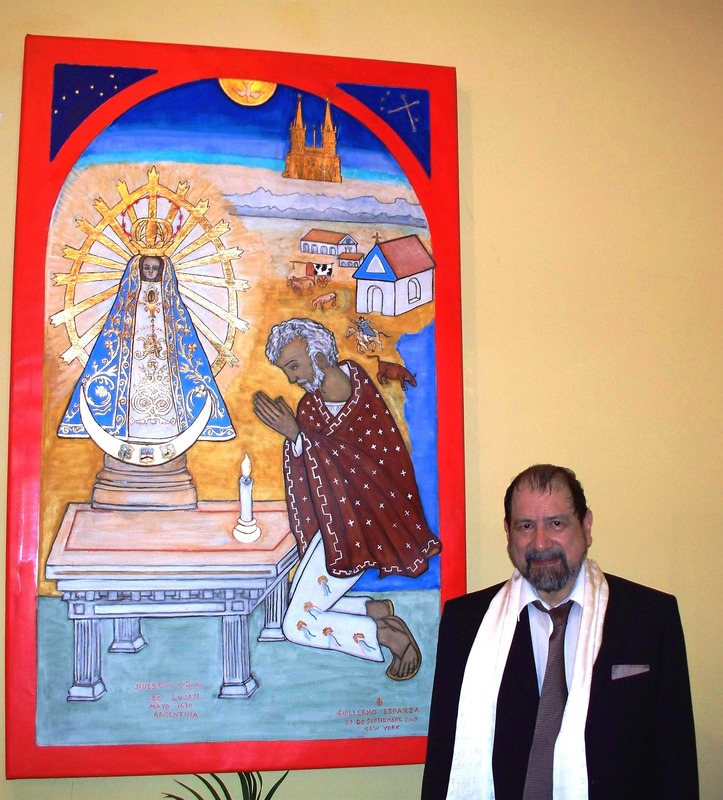 Guillermo Esparza, a master iconographer, sculptor, and painter, is renowned for his sacred art installations in the United States, as well as abroad. The carpentry for the table, following the design by Guillermo Esparza, was executed by Jeff Taisey, known for his work for numerous major motion pictures. The shrine was blessed by the Cathedral's pastor, Msgr. Donald Sakano. Another important sacred art installation by Guillermo Esparza unveils on October 15, 2009 at the Holy Name Chapel, St. Patrick's Old Cathedral. As an addition to the on-going sacred art exhibit, "Arcanum Angelorum" (Mystery of the Angels), Guillermo Esparza's latest mural icon is "The Deisis". It depicts Pantokrator (Christ), Theotokos (Virgin Mary), and Prodromos (John The Forerunner). The Deisis is the central part of some Orthodox churches. This mural was executed by Guillermo Esparza in oil and gold on linen, and is 10 feet high and 7 feet wide. Due to an extraordinary popularity of the event, an exhibit of sacred art - "Arcanum Angelorum" ("Mystery of the Angels"), Art in the Sacred Canon, - with works by Guillermo Esparza, award-winning, internationally recognized American iconographer, painter, and sculptor, is extended through the end of 2010 at St. Patrick's Old Cathedral in New York. The exhibit commemorates the Bicentennial Celebration of the Cathedral located in the historic SoHo neighborhood in New York City and the restoration of the tabernacle of the church by the artist-in-residence, Guillermo Esparza. The exhibition features recent paintings of angels in oil, icons in egg tempera and gold, drawings, as well as sculptures and mural designs. The exhibit takes place in the undercroft of the Old Cathedral in the Holy Name Chapel, opposite 263 Mulberry Street. Guillermo Esparza launches his sacred art lecture series on iconography and on "Our Lady of Perpetual Help" icon at the Cathedral. Guillermo Esparza is honored for his work by New York Mayor Michael R. Bloomberg, and receives Proclamation from the Mayor, honoring his current sacred art exhibit, "Arcanum Angelorum". Guillermo Esparza is the subject of the documentary by Los Angeles filmmaker Veronica Aberham for Studio-Online, an affiliate of London-based Studio International. Original soundtrack is composed and performed by Esparza's wife, composer and pianist Maria Andriasova Esparza. The film is released on June 1st, and premiers on June 7th, 2009 at St. Patrick's Old Cathedral for its 200-year anniversary, following the historic mass delivered by Archbishop of New York Timothy Michael Dolan. Russian-language version of the film is translated by Columbia University-trained scholar, Olga Zvenyatsky. Moscow P. I. Tchaikovsky Conservatory and The Juilliard School graduate, composer Maria Andriasova Esparza, is nominated for the distinguished international "Mozart" award from the International Biographical Center, Cambridge, UK, for her original music to this documentary. The soundtrack is listed on Top-40 / Sony Masterworks. Guillermo Esparza (http://www.guillermoesparza.com), the Artist-in-Residence at St. Patrick's Old Cathedral in New York, is an award winning internationally recognized American iconographer, painter and sculptor with collections at the US national archives, the Phanar in Istanbul, Turkey, the Vatican Museum in Rome, Italy, Smithsonian American Art Museum, as well as numerous cathedrals, churches, museums, public art collection, and private collections internationally. 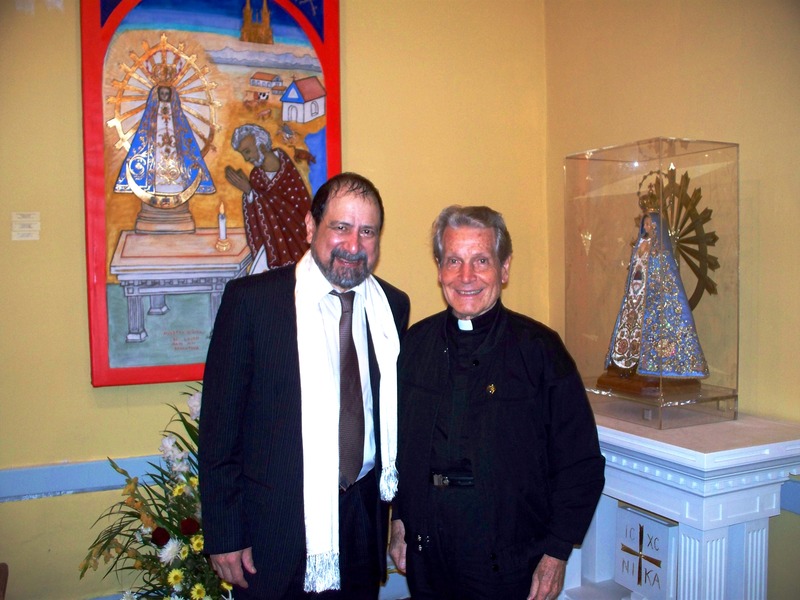 An ecumenicist, Mr. Esparza has been awarded important commissions by churches of many denominations, and his original works are installed in Episcopal, Roman Catholic, Byzantine Catholic, and Orthodox Churches. A visionary in the world of public art in the US, Mr. Esparza is the first recipient of the "Percent-For-Art" public commission from the State of Arizona in 1986, thus opening the door to the next generation of artists competing for public commissions. 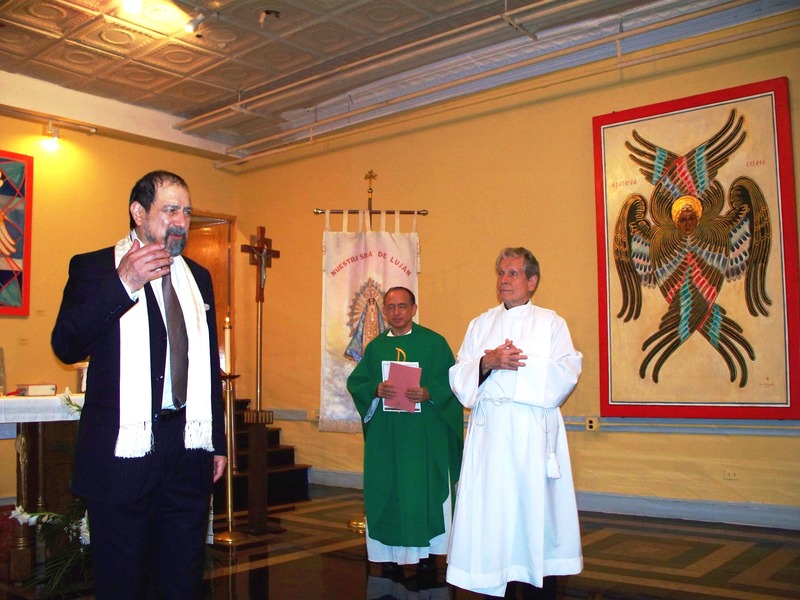 Guillermo Esparza has been honored for his work by His All Holiness Bartholomew I, His Holiness the late Pope John Paul II, New York Mayor Michael R. Bloomberg, among others. Mr. Esparza's family built churches and cathedrals in Mexico. His paternal grandfather, Don Manuel Esparza, was a prominent US landowner and businessman, whose family held Spanish land grants in Mexico since the 17th century. Mr. Esparza's maternal grandfather, the noted architect and engineer Don Benito Hernandez y Quiroz, was instrumental in bringing electricity to Guatemala. Guillermo Esparza is married to American concert pianist, film composer, and producer Maria Andriasova Esparza (http://www.andriasovaesparza.com), daughter of the legendary Russian composer Iosif Andriasov. Maria and Guillermo Esparza live and work in Manhattan. The chapel is open daily for services at 9 am and 12:10 pm, except for occasions for major feasts or First Fridays.